This week, I have another free ebook for you. 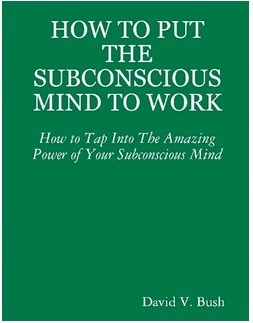 How to Put the Subconscious Mind to Work was written by David V. Bush in 1924. Written in the natural parlance of the time, Bush covers a variety of the pain and pitfalls caused by negative responses that we receive throughout our lives. There are examples included to ensure comprehension. It's interesting that this, like other books that I've posted here, are written from a Law of Attraction perspective. I say interesting mainly because of their age, although it's been proven time and again that people throughout the ages have been very aware of how powerfully our thoughts and energies affect our lives. 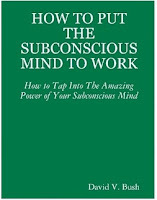 "...what you desire you should ask for in secret, and it will be presented to you openly"
How to Put the Subconscious Mind to Work includes tips and suggestions for healing and reprogramming the subconscious to make it - and you - healthier in all areas of life. There's lots of good information in here. Have we heard all this before? Sure but not put quite this way. Update, April 29/13 - It just came to my attention that the installation below is not always showing the book content. My apologies if this is the case for you. You can read it online or download it from the above link(s).